Bike along the dikes of the Elbe and the North Sea in Schleswig-Holstein, across central Jutland and around northern Zealand. very difficult if the wind is against you. In the rest of Denmark, easy to moderate. Train connections allow skipping sections. This semi-circular ride visits a variety of landscapes and two different cultures: that of Germany's most northern state,Schleswig-Holstein, along the North Sea, and that of Denmark. While you will visit some interesting, even memorable attractions, this ride is more about seeing rural landscapes and ways of living. You ride for miles along the North Sea for miles, and through farmland, villages, a lake district , artist colonies, woods filled with vacation homes, industrial areas, fishing villages, and the suburbs and great cities of Hamburg and of Copenhagen. Although you can ride short distances each day if you wish, I suggest days of around 80 or 90 kilometers. This is a five-hundred mile trip; sights are widely spaced; and the terrain, generally is flat to lightly rolling. As you ride northeast in Denmark, locals will warn you about the mountains to come in the lake district. Don't worry! Denmark's highest mountain is 171 meters (561 feet) above sea level. You will ride upon cycle paths or along country or seaside roads without much traffic. The bike paths most often are paved, but some are dirt with grass and occasional rocks. It is usually not necessary to stay on these bike paths, which in Denmark are often circuitous. Because of the rural nature of the trip, traffic on the highways is often light. By riding on highways you will ride faster and also save kilometers. In the heart of Hamburg, I recommend you walk, not cycle. In Copenhagen and its suburbs you will usually ride in bicycle-only lanes. 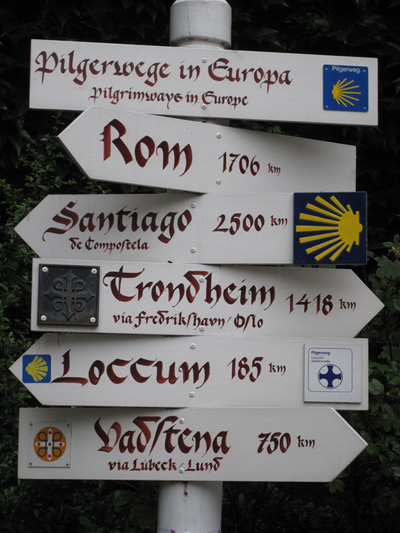 Your route will be waymarked (signed) in both Germany and Denmark, but the signs can be insufficient. Moreover, you may wish to deviate from the official route. Thus I strongly recommend maps (see the section on Practical Information). 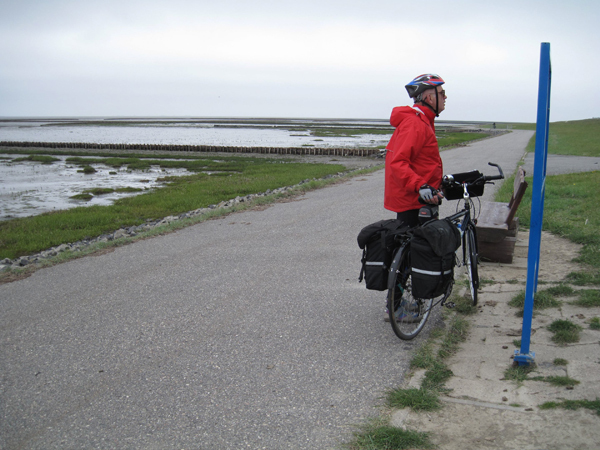 While mountains are not a problem, wind along the North Sea Dikes can be a serious problem during the first part of this ride along the North Sea. The average wind speed along the north sea in Germany in July is 17 miles per hour (and 15 mph in August). Near Esbjerg, Denmark, the average speed is less, only about 13 mph. This average conceals the effect of a sea breeze that picks up towards land by mid day and flows out to sea at night. Thus the afternoon wind can blow onshore at 25 miles per hour; and it will be concentrated by the dike. If a cycle path exists on the leeward side of the dike you can shield yourself somewhat, but only somewhat. Another problem is with the average wind direction. Most often the wind blows from the southwest, and is behind you as you ride north; but almost as often the wind blows from the northwest, and glancing off the dikes, will be directly in your face. We were unlucky on our trip. We faced afternoon headwinds up to 40 mph, and could not ride faster than 4 or 5 kilometers per hour. A few kilometers inland the wind was less, but still strong. You will see wind turbines everywhere in Schleswig Holstein, the world capital of wind power. We took the train to keep to our itinerary. Against the wind, only the strongest and most determined riders will tough it out. If luck is with you and you have the wind at your back (as happened one out of our two trips along the North Sea in the Netherlands) you will sail along and arrive early at your destination. Once you leave the North Sea and ride eastward, the wind will mainly be at your back, although not necessarily so. Storms can arise, and the wind can blow from any direction. Average high temperatures in July and August are 68F (20C)and lows are 53F (11C), except. Hamburg is a bit warmer. Expect one-third of the days to be slightly rainy in Germany, one it two near Århus . We experienced only one downpour. In Hamburg and Schleswig Holstein, the people we met in hotels and restaurants, in stores, on the train and at the art museums were business-like — helpful if asked but not overly so, not openly friendly, not ebullient but, rather, reserved, hard-working, conservative in dress. 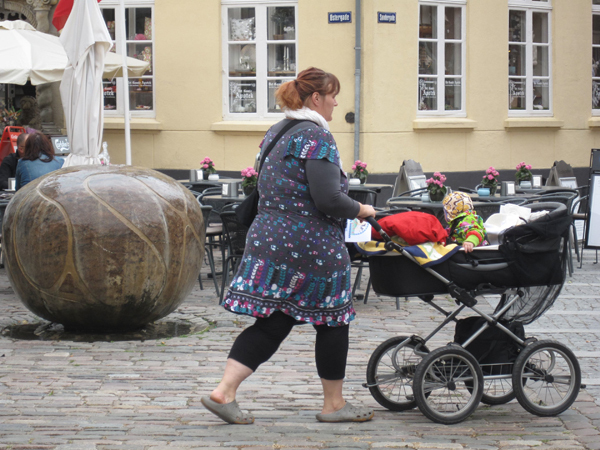 In Denmark we saw a wide range of demeanors and styles. People were conservatively and inexpensively dressed in the farming area in Jutland's south. Homes were traditional, with no style. Scandinavian Design, one friend told us, is only for the rich. In the lake vacation district and in Copenhagen people were in general more stylish. All the Danes we met were extremely helpful, often volunteering to help when not asked. Are the Danes the happiest people in the world? An international survey found that. Our friend, an artist, in the farming country of southern Jutland thought this was nonsense; people weren't very happy around there, she thought, due to tough times. The people we met in the lake district, near Ebeltoft, and in North Zealand near Copenhagen seemed very happy. You can't help but notice how much smaller the average home is, compared to the United States or France or even England, and how relatively few and small the automobiles are. Income and sales are heavily taxed and government entitlements are extensive. Automobile and motorcycle purchases, are taxed at a marginal rate of 180%, that is, a $20,000 car elsewhere, after being taxed in Denmark, costs $48,000, and a $5,000 motorcycle costs about $13,000. (There are some small credits for low gas consumption). Motorcycles that cost over $1,000 are taxed at 180%. Thus, many people do not own a car and transport themselves by bus, train, subway and — bicycle. Hamburg (Michelin ***, many sights), Glückstadt (ancient port), Sylt**(beaches and dunes), Tonder*, Ribe**(oldest preserved Danish town) , Jelling* (church, burial mounds and rune stones) , Legoland Park** near Billund, Århus** (important port, museum, old houses), the hills near the tiny artist village of Ebeltoft , Elsinore Castle*** in Helsingor (Kronborg Slot, Hamlet's home), the Louisiana Museum*** (one of the great small art museums of the world in a beautiful seaside setting), Fredericksborg Castle***(lovely grounds), Fredensborg Palace (the royal couple's favorite residence is open for guided tours from July 1 to August 5--off route visit by train from Helsingor), and Copenhagen*** (many sights, get a guidebook). 1) The itinerary of our trip, which followed the North Sea as far Ribe, then headed northeast to lake district of Jutland near Skanderborg and further northeast to the artist colony of Ebeltoft; then after two ferry rides visited the northern and eastern coasts of Zealand, ending in Copenhagen. 2. A loop trip from Hamburg around Schleswig-Holstein, perhaps with a visit to Sylt. 3. A loop trip leaving and returning to Copenhagen, perhaps crossing by Ferry to Sonderborg, then to Tonder, and then as per our trip. 4. A loop trip from Hamburg or Copenhagen that would cover our route plus a ride between Copenhagen and Hamburg via Rodbyhavn, Oldenburg, and Lubeck. 5. A trip from Hamburg or Berlin to Copenhagen up the east side of Schleswig Holstein and through southern Zealand. Our Detailed Itinerary for Cycling from Hamburg to Copenhagen via the North Sea. Both the Angles and the Saxons, who came over to England (Anglia) with their languages, are believed to have come from Schleswig just south of the border with Denmark. Then the Jutes occupied Schleswig and soon came to England, as did the Frisians. The mixed German-Danish population of Schleswig Holstein was ruled by the Danish king until 1864, when Germany won the Schleswig war. Hamburg is Germany's second largest metropolis, with over 4 million inhabitants. Hamburg is a city of canals, more than Amsterdam and Venice combined, with 2,300 bridges. These are mainly in the port area and along the Elbe. The harbor is the largest in Germany by far and the third largest in Europe after Rotterdam and Antwerp. Although much of the port and surrounding areas were destroyed by Allied bombing during WWII, central city architecture from the past remains. Saint Michael's church,the city hall, the Alster park, and the central shopping area are worth visiting, as is perhaps the infamous Reeperbahn red-light street. Consider a harbor tour. The museum(Hamburger Kunsthalle) contains old masterpieces and modern works by Courbet, Gauguin, Monet, Renoir, Toulouse-Lautrec and Degas, as well as Piccaso, Beckmann, Klee, and Kirchner. There is a new wing of contemporary art. I recommend visiting Hamburg for at least a full day. Along the Elbe, just northwest of the city, is the Altona district. If you stay near the Elbe in Altona, as we did, and take a bus into the city, you won't have to ride out of Hamburg to get on the bicycle path. 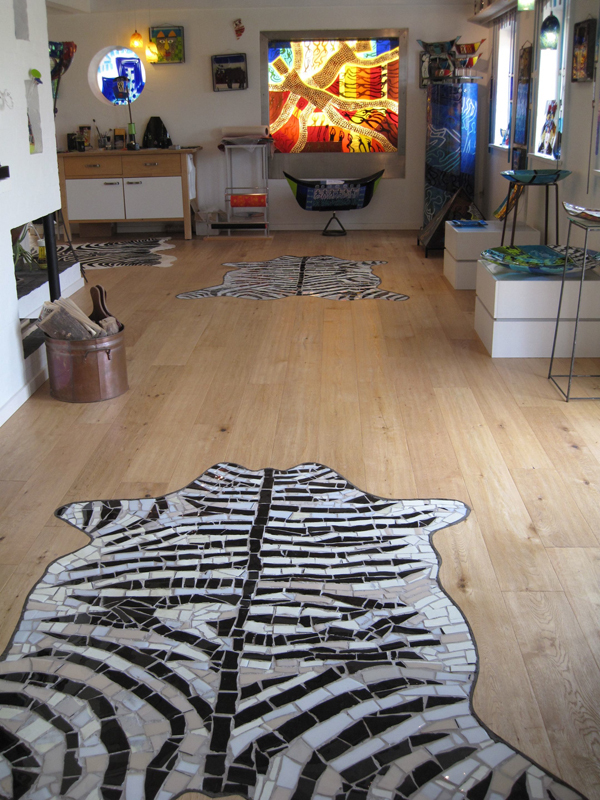 The area of Altona along the Elbe, particularly the village of Blankenese, is well-to-do and very charming. 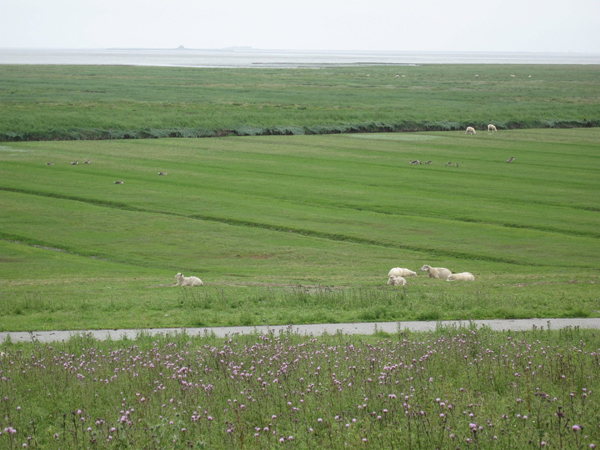 The outer Elbe River and the North Sea-side is not home to castles, fields of flowers, and perched viewpoints: It is flat and monotone. Sometimes it's sunny, but more often bleak and shrouded in sea-whipped mist. Hundreds of thousands of sheep graze along the endless miles of the earthen dike, and you you must bike around their excrement — if you can. Fenders are a necessity. The sheep excrement nourishes grass that fortifies the earthen dike against gales and waves, and their hooves compact the soil against erosion. Without the sheep there would soon be no dike. You will long remember the endless ribbon of asphalt bike bath, green grass, blule-gray sea and white sheep, interrupted every mile or two by swinging gates that you must dismount to open. Is this ride worth it? Absolutely. It will form a lasting memory of muted beauty. 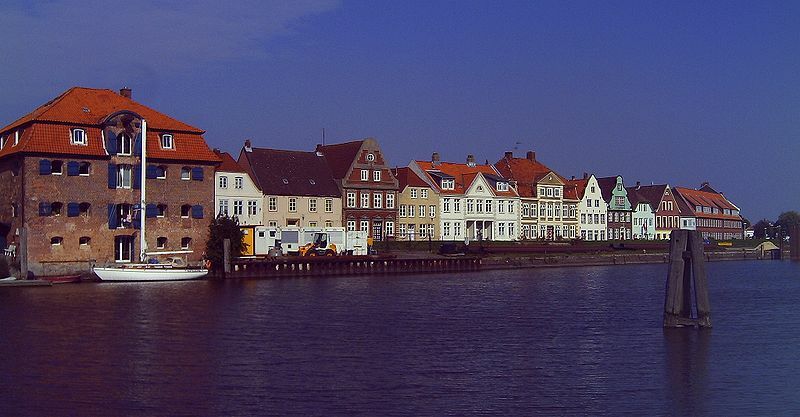 There are many other villages and small towns along the North Sea, or a few kilometers in land from it. 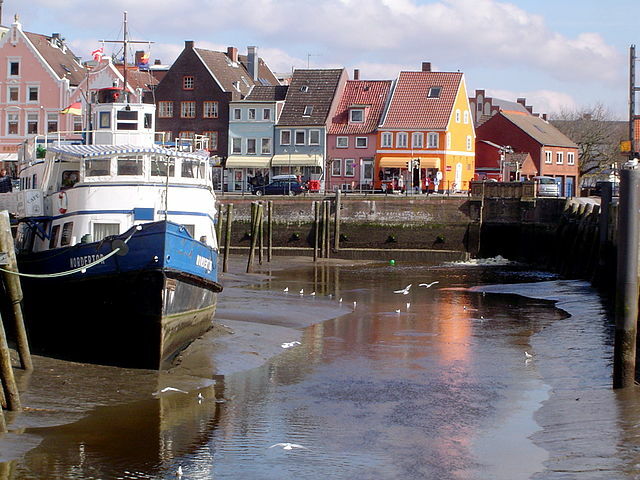 Husum (249 km from Hamburg) is the largest, and worth of a night's stay. Chose other stops according to your riding ability and the wind speed. Because of a limited time window and fierce head winds, after riding a half-day from Glückstadt we took the train from Melsdorf to Husum. This part of Schleswig-Holstein is called North Friesland. (Friesland is a district of the Netherlands.) One of its claims to fame is as the world capital of wind power. As you ride, looking inland, giant wind turbines sprout like weeds. A short distance north of Husum, reached either by a bike path along the sea or by an inland bike route, is the extensive Hattstedter Marsh filled with bird life. A days ride of 81 km from Husum brings one to Niebüll, which is the last town before the Danish border. 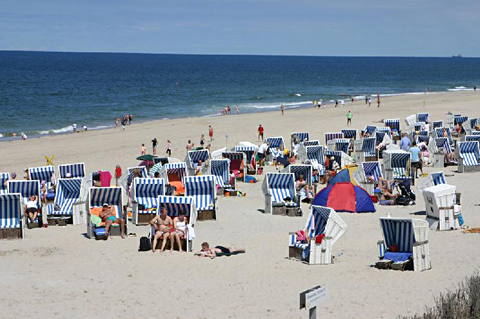 Some riders may wish to visit the resort island of Sylt, which is the northernmost place in Germany. It is known for its pristine dunes and beaches, many of which are clothing-optional. To visit Sylt, you must take a train — either from Niebüll or Klaxbüll — over the causeway, but once on the island there are excellent bike routes. Föhr and Amrum are other resort islands in North Friesland. North of Niebüll by 19 kms is the home-museum of the German Expressionist painter Emil Nolde — absolutely worth a visit. Although Nolde was a fervent Nazi, the Nazi regime viewed his art as degenerate, and banned them and him from public life. 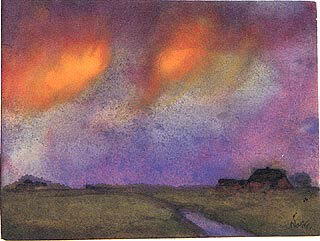 While Nolde's political views were deplorable, his painting was very beautiful. One section of the museum traces Nolde's life; the other part, located in Nolde's house, contains Nolde's paintings created during exile. There's a lovely flower garden that inspired many of Nolde's paintings. 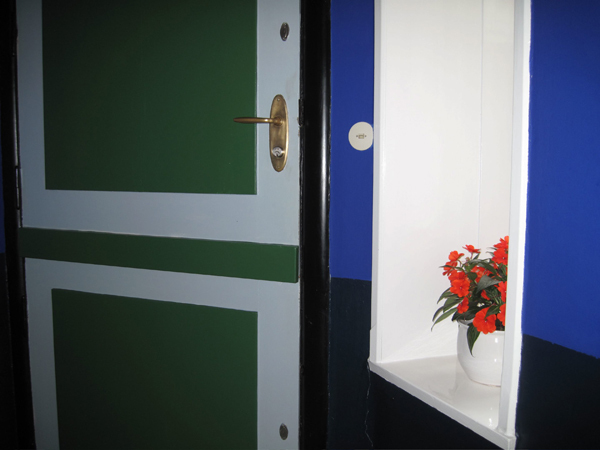 It is a ten-minute ride from the museum to the Danish border. 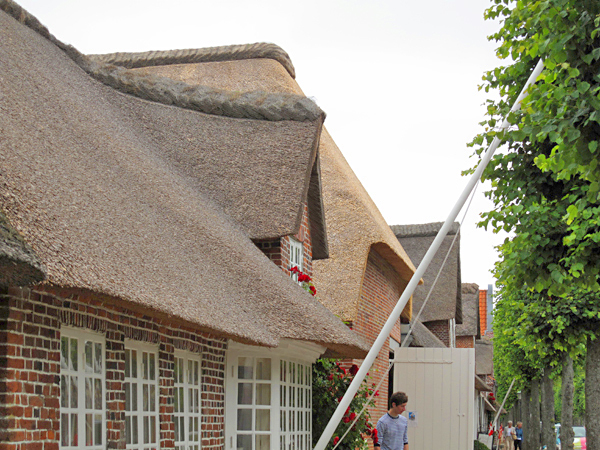 The very first village you come to in Denmark is strikingly beautiful Møgentønderm . 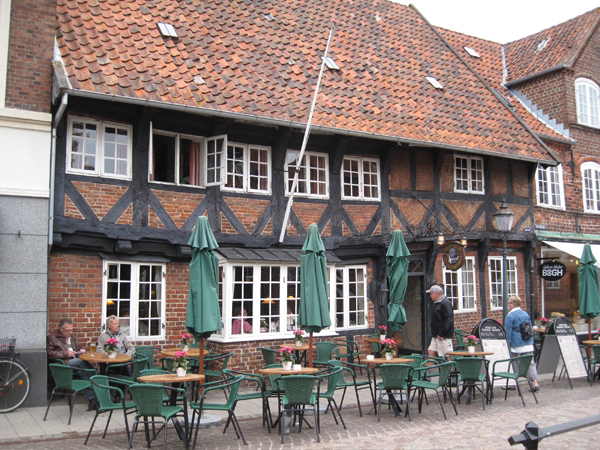 From there, in a few kilometers, you reach Tønder, with all kinds of shops and services. 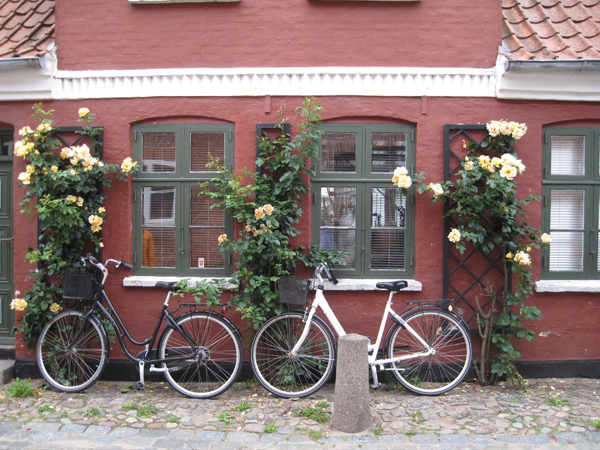 I strongly recommend that you cycle to Ribe. 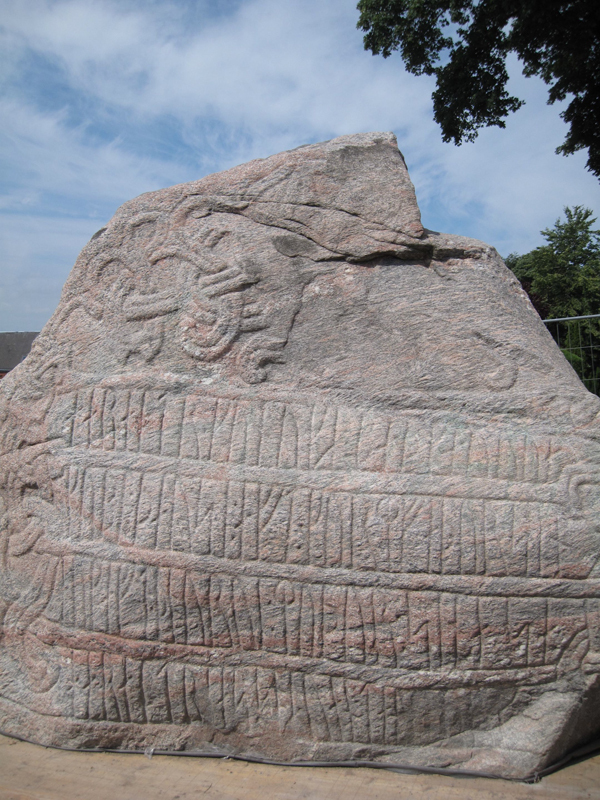 Ribe is the oldest Danish town and it has an interesting Viking museum. If you cycle by the sea, consider a shortcut off bike-route to Højer, and then follow national cycle route #1 (NR #1). It's is a 64 kilometers ride. If the wind is blowing from the northwest, you could rather take the inland, local route #9 (LR #9) as far as Arrid, and then, using your map, take back roads from there to Ribe. It is a ride of 53 kilometers. From Ribe our route took us to us eastward to national route #3 to the intersection of NR #3 and highway #43 near Rodding. If we had ridden via Jels on local routes #4 and #9 and NR #3 it would have required 59 kilometers to this point. By staying on Highway #437 to Rodding and then taking the road to Skodborg, both without much traffic and a very fast riding surface in the breakdown lane, it required only 26 kilometers to reach this point. We followed NR#3 northward to Jelling. This is a beautiful ride, eventually entering a forest. The road is named the "Hærvejen", or Army Road, and it was the in history the main road up the Jutland peninsula, running along the central ridge, with no need to cross rivers. It extended as far south as Hamburg and as far north as Viborg. From the intersection mentioned above, it is 46 km to the intersection of National Roue #3 and local route #34. It is from here 15 km to Legoland in Billund. (One could save at least 25 kilometers by riding on highways from Vorbasse.) Or, continuing on NR#3 it is roughly 11km to Jelling. Thus, with the highway shortcut we took, from Ribe to Jelling is 83 km. Entirely by bike route it is 110 km, a long day. For those who wish to do so, there are several places along the way to overnight. It is 38 km from Jelling on RN#3 to the intersection with RN#4 in Vrads. From there it is 26 km or so to Ry. A few kilometers before Ry you have your first climb of trip, 60 meters (200 feet) over 2.5 km. Ry is a nice resort town. There is an excellent Italian restaurant in Ry and a seafood restaurant with a view of the lake, among many choices. 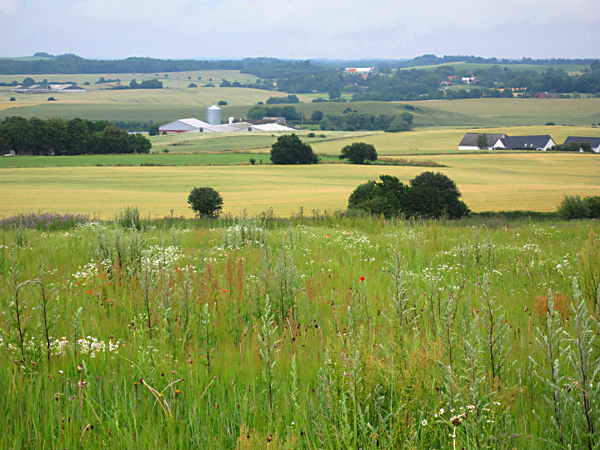 It is approximately 40 km over hilly terrain from Ry on RN #4 to the center of Århus . 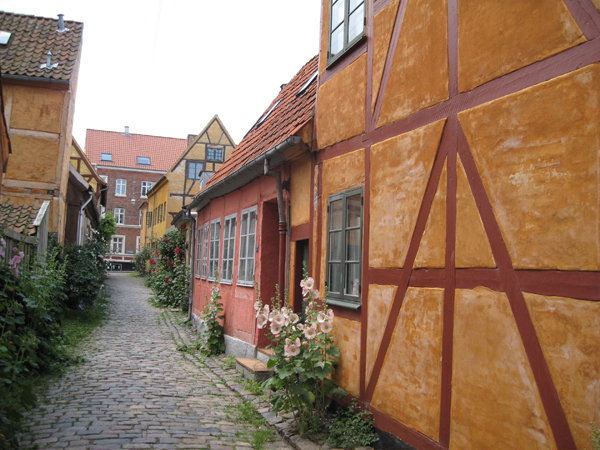 Århus, the second largest port in Denmark has some attractive old houses, a museum. 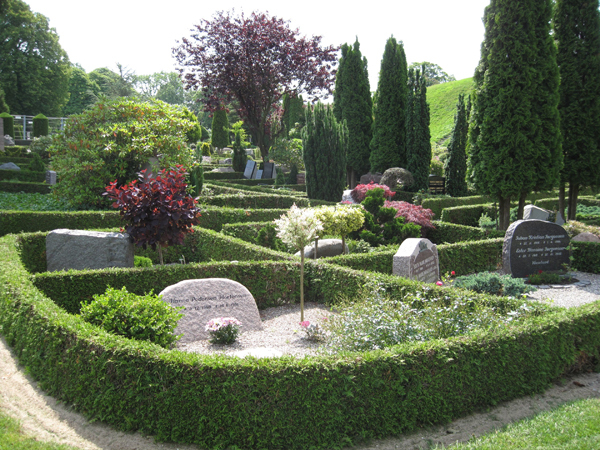 We continued on along the sea, now on NR #5, and through rolling terrain as far as Ebeltoft, 50 km from Århus. The last kilometer of the trip is on NR #2. This was perhaps the hardest day of our trip. 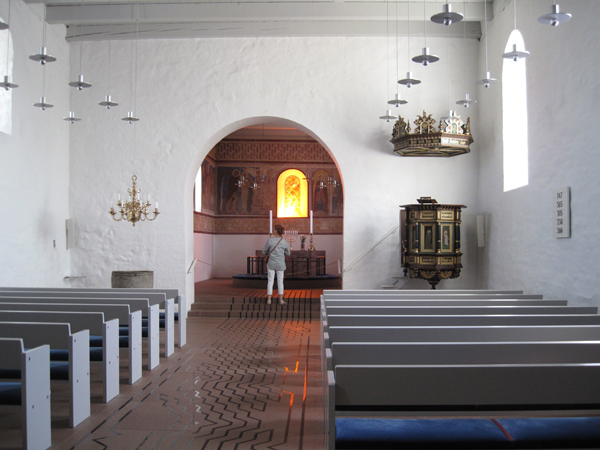 Ebeltoft is an artist colony, perhaps due to its setting in rolling farmland along the sea. The bicycle route (NR #2)is circuitous and confusing (6 km). You might consider staying on the main road, saving 1.5 km. You must purchase your ticket before boarding the ferry. It costs about $20 to$30 per person. Bicycles are free. This high speed ferry makes the 25 mile crossing to Odden in about 55 minutes. One of the most charming parts of this entire bike trip is the ride across the 2 kilometer-wide Zealand Spit on National Bike Route #7. Twenty kilometers long, it is filled with tiny vacation homes in the woods, check to jowl , forests and small farms. Another 20 kilometers of biking, the last part of which is NR #2, brings you to Rervig Ferry Terminal. The ferry ride from Rørvig to Hundsted takes 25 minutes. The cost for adult with a bike is about $12. In Zealand you have many different bike routes and of destinations. You could ride to castle towns or directly towards Copenhagen. Our route headed northeast around the top of the Zealand peninsula to Gilleleje (45 km). Because of the delay from several flat tires due to bad tubes, we often took the main road instead of following the bicycle path. With the waits for the ferries the ferry rides, the flat tires and a total ride of almost 80 kilometers from Ebeltoft, we arrived after 7 PM. It may have been better to have chosen lodging closer to Hundsted. From Gilleleje, the 25 km ride from Gilleleje to Helsingør along the coast passes countless seaside homes. Helsingør is an interesting town, with many old houses, and the famous "Elsinore" castle where Hamlet lived. 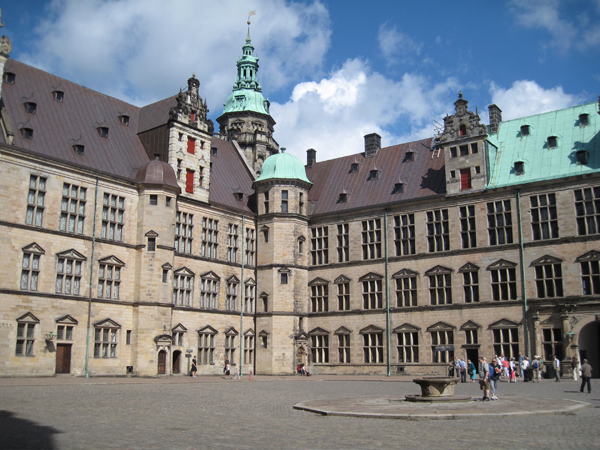 This castle, named "Kronborg Slot", is well worth a tour. 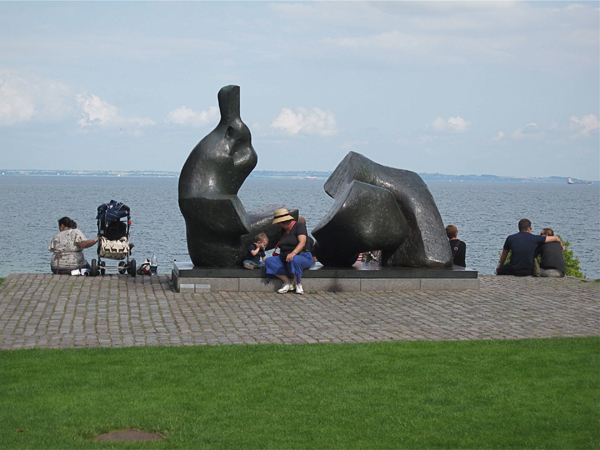 The view from the ramparts to the east is striking: Four kilometers (2.5 miles) across the water lies Helsingborg, Sweden. This strait is the entrance to the Baltic Sea and the castle lies at the narrowest point. From the early-fifteenth century until the mid-nineteenth century, the Danish king, who up until 1658 controlled both sides of the strait, extracted a toll called the Sound Dues from every passing ship. Because of this income, unlike the kings of England, he was able to remain independent from the nobles and people. From Helsingør it is a 40 kilometer ride, mainly along the sea, to Copenhagen. On your way, you should on no account miss the Louisiana Museum in Humlebæk. Not only does this museum have a superlative setting overlooking the sea, and fine permanent collections — including a fabulous sculpture garden, but also it stages very impressive, very well researched temporary exhibitions. Very highly recommended. After passing many lovely villas and suburban towns, riding on roadside bike paths or in bike lanes, you arrive on the city limit of Copenhagen. Here bike paths or bike lanes line most of the main streets. This detailed map (which can take several minutes to download) shows all the bicycle routes in Copenhagen. 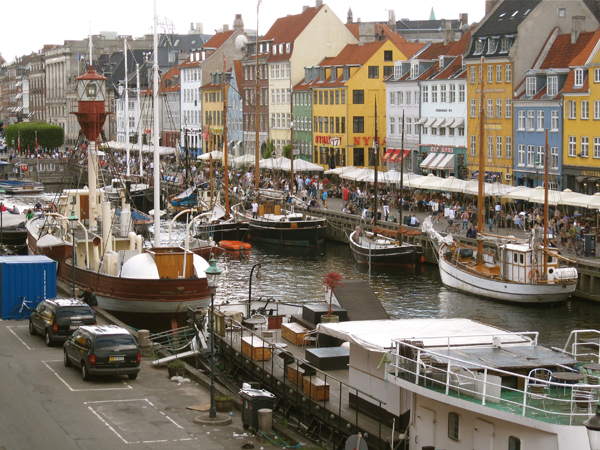 Copenhagen is a fabled tourist city, with much to do and many tourist sights. Our trip ended here. The loop I have described is one of very many alternatives routes you could choose in northern Germany and Denmark. I hope you visit these northern lands, and that you enjoy your visit to as much as we did! Summer, especially July and August, for the warmest weather. Danish krone (plural is kroner). There are about 9 Danish kroner to the Pound, 7 to the Euro, and about 5 to the US dollar. I have been unable to turn up any addresses, in either Hamburg or Copenhagen, for quality bicycles suitable for a multi-day trip. Therefore, bring your own bicycle. 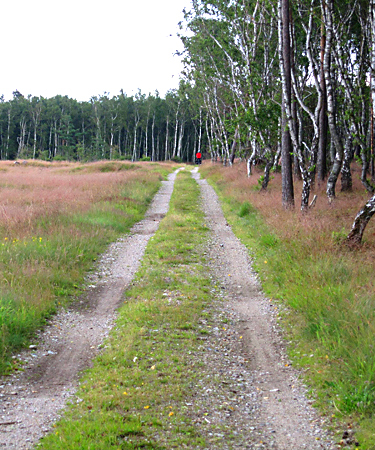 Because of some grass-dirt-rocky sections, particularly in Denmark, use 28 mm tires and tubes or wider for light touring, 35 mm tires and tubes or larger for camping. 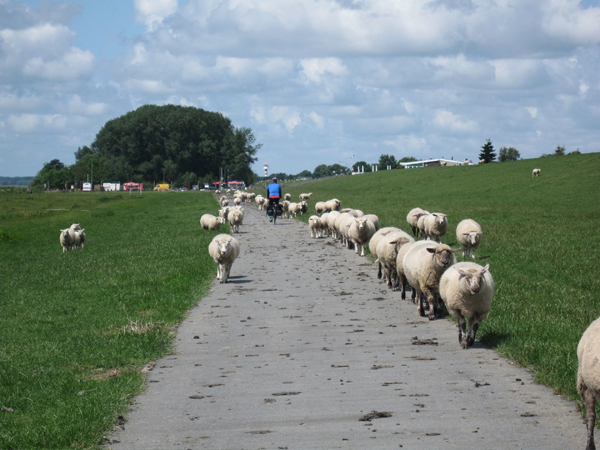 Fenders are a necessity, both for the rain and the sheep dung along the German dikes. For the German portion of this trip, you could try to live with screen-shots of online maps for the North Sea Cycle Route: http://prod.avinet.no/coastalive/default.aspx?gui=100001&lang=1. Check the box for the North Sea Cycle Route, and enlarge the map as necessary. However, I do not recommend this approach, both because of its clumsiness and the lack of information. I recommend, rather, that you purchase the spiral-bound Esterbauer Guide "Nordseeküsten-Radweg 3", which can be mounted under plastic on most bicycle bags. The guide (€ 12.90) is in German only, but the map key has English translations. The maps are excellent and very useful; they give some preferable alternative routes to the main NSCR. The pages in the front list bicycle shops and tourist sights. In the back are lists of less expensive accommodations, organized from South to North. The best way to order these guides is to call Esterbauer directly in Austria : (country code 43) 2983 28982 0. Ask for somebody who speaks English, and provide your credit card info. I recommend following up with an e-mail containing the delivery address at www.esterbauer.com. You can also order this book online from Stanfords, London (www.stanfords.co.uk) for £13.95 plus shipping. Esterbauer publishes another guidebook for the North Sea Route in Denmark. Throughout the text of the Esterbauer Guide there are "tipps" (tips). Often they contain important information, such as the fact that a bridge is closed during certain hours. Before leaving on your trip, assuming you don't read German, type the text of the tips into Google translate (translate.google.com) or Microsoft's online translation program (www.bing.com/translator) and pen words from the results into the guidebook. For cycling maps of Denmark, you could try to download the routes online: http://cyclistic.dk/en/, but this will be much less useful than ordering cycling maps. I suggest that you phone the Dansk Cyklist Forbund at (country code 45) 33 32 31 21. Ask them to transfer you to the boutique, and to speak with somebody who knows English. Ask for the English versions of the Cycling Guides (DK 129 = ~ €18 each) that you need. Due to language difficulties, I suggest that you follow the call up with an e-mail to butik@ dcf.dk.The Cycling Guides come with a booklet and a map. The booklets can be left them at home, but the maps are very useful. Ask about shipping cost; it may be free or less if you only take the maps. The route here used the South Jutland map, the East Jutland map, and the North Zealand map. There are also maps and books (not in English) for West Jutland, North Jutland, and South Zeeland. These maps are also available from Stanfords in London, but are prohibitively expensive (£31.95 each). The bicycle routes in Denmark are numbered. There are nine national routes, shown with red squares on the maps. Starting from the west the north-south national routes are numbered 1,3,5,7 and 9, and the east-west routes are numbered starting from the north 2,4,6 and 8. There are also local routes, shown in blue squares, numbered from the single digits into the sixties. The scale of the maps is 1:100,000, that is, 1 centimeter represents 1 kilometer. A fault of the maps is that distances are not indicated, so you will have to measure out distances with a ruler or trace them on a program such as Google Earth. You will need unusual skill to pronounce or understand Danish. All the vowels have different sounds than we are used to, and the phrases have a different intonation. Fortunately many people speak excellent English. For lodging, you can choose between hotels, B&B's, rooms for rent, or camping. Lodging can book up during the summer in resort areas, so advance reservations may be helpful. Hotels and B&B's typically cost from € 60 to €200 per night (2012), depending upon the degree of luxury. Campgrounds run about € 8 to €15 per person. 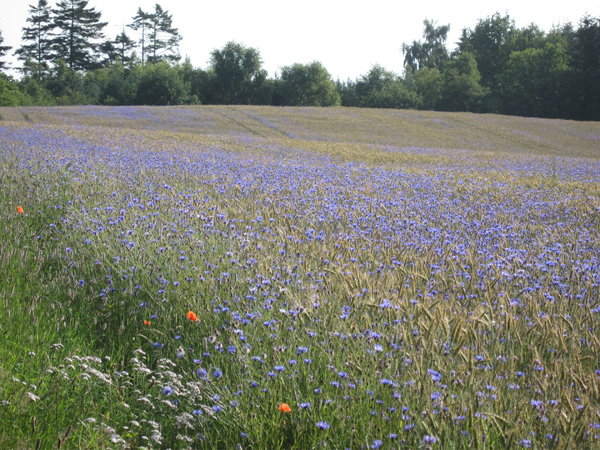 There is also a network of very low cost or free campsites for walkers and cyclists. To find hotels and B&B's, the Trip Advisor website is a good starting point. 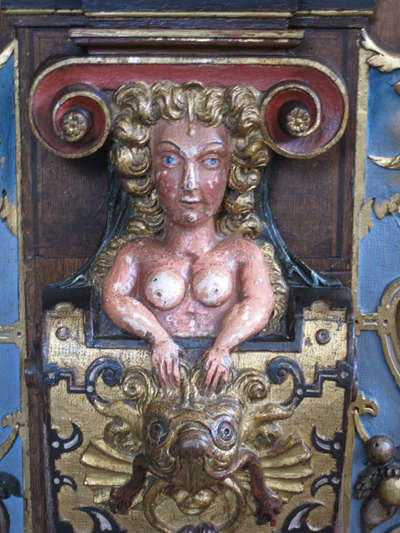 In Denmark, www.visitdenmark.com may turn up some additional possibilities. Click on Accommodation. In Germany, the tourist office of the larger cities have helpful lists. For camping an internet search under camping Germany or camping Denmark will turn up several sites in English. http://udinaturen.naturstyrelsen.dk/udinaturen/ This site has a map with cycle routes and inexpensive camp sites on it. Zoom in to view the stacked sites. To my knowledge there are no luggage transfer service along this itinerary. Those riders who require baggage transfer might consider a commercially organized bike tour from Berlin to Copenhagen.